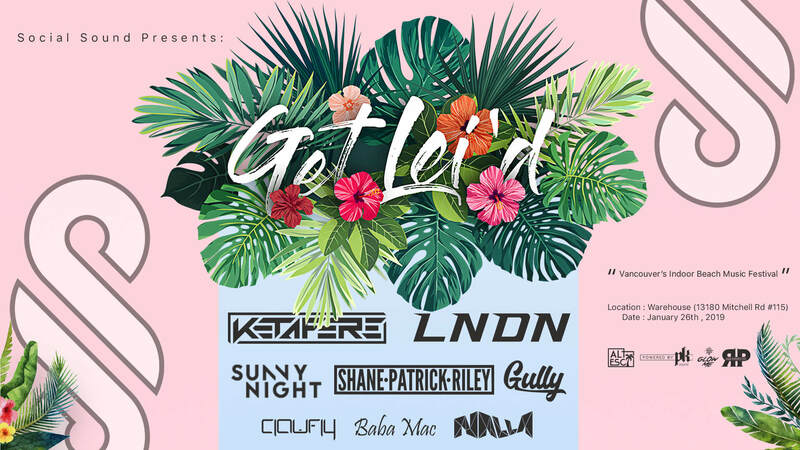 “Get Lei’d” and escape with Social Sound at Vancouver’s only Indoor Beach music festival! We are bringing the best of house music, Hawaiian vibes and heat during this cold winter season. Located just south of Vancouver, we have an entire warehouse filled up with a sand dance floor. We will be decorating and building up a stage which will be powered by PK Sound. We will also be donating $4 from every online ticket sold to provide clean water for those less fortunate then us with the Party Well UBC team. Contact socialsoundevents@gmail.com or any of the DJ’s for hard copy tickets with no service fees. We will be running a limited $10 round trip shuttle service from downtown to the venue and back downtown to the afterparty @ VAL. Don’t miss out on a crazy night!! It will be heated inside so dress for the beach. Wear pants with shorts underneath, or tank tops under big parkas or whatever you like! You will NOT be allowed to wear any shoes/sandals/flip flops on the sand. You MUST be Bare foot. There will be a coat check where you can leave your shoes, jacket, bag, etc. NO GLITTER or like substances please. It’ll fall in the sand and its hard to clean up after. we want to keep the sand clean as possible. We will have a security team on detail to check for ID’s, check bags and jackets for weapons, outside drinks, etc. This event is 19+ and will have a bar on site. 2 pieces of ID will be required for purchase of any alcohol. You must drink the alcohol in the designated area. Again NO drinks on the sand please. We want to respect the venue. NO smoking inside. You will be allowed to go outside for a smoke if need be, and we suggest that you bring a pair of flip flops or easy slip-on shoes you can leave at the door. Again, you will not be allowed to wear shoes on the sand. Do not drink and drive. Carpool with a DD or contact us for a shuttle service. There will be a medical team on site. Online sales are closed. Text 250-751-5499 for last minute tickets. All patrons must be 19 years of age with valid ID. Contact us using the form below and we will get back to you as soon as possible! Once upon a time, two house party pros turned corporate booking hustlaz went on an acid-induced vision quest… and the rest is a blur. Social Sound is a new wave of creative entertainment with roots in Vancouver and Tokyo. We are constantly building a collective of various artists and creatives to expand local culture and music to its prospective audience. 2018 © altesc. All Rights Reserved.